Want the link for online giving? 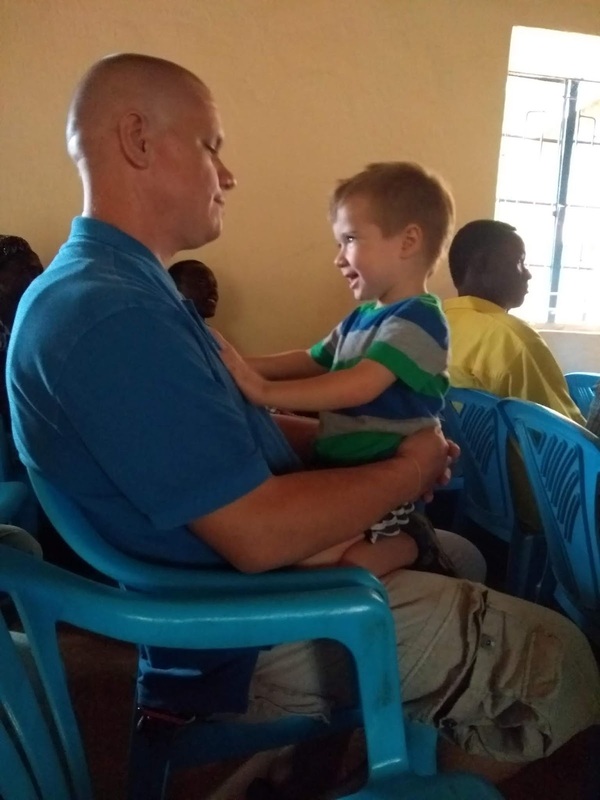 From 2010-2011, Justin spent over a year in Southern Sudan doing evangelism in some very lost areas, and helping disciple some of the local pastors. While there, he came face to face with the great need for the gospel in many parts of this new country. After Justin and Amy got married in 2011, they raised support and went back to South Sudan to work on church planting and discipleship. The Lopit people live in and around the Lopa Mountains in South Sudan. The people group is approximately 76,000 people according to the Joshua Project, with almost no Evangelical Christians. With no Bible translation and very little church planting activity, their eternal outlook is rather bleak. Justin and Amy plan to spend however long it takes in Sudan helping bring the gospel of Jesus Christ to these unreached, hopeless people. We are working in the villages with a few believing people to try and spread the gospel and teach Bible stories to those who are believing. We believe firmly that the Sudanese church can stand on its own without outside, western aid, and we fully intend to partner with the Sudanese church in a way that will empower the locals, while not being afraid to stay as long as it takes to build real disciples and see a growing, thriving, reproducing church in a tribe without their own Bible. Would you be willing to pray and/or financially support us as we follow God’s call in this endeavor? During our stay in Torit we went to a church, in a building, with instruments. Something that our kids aren’t so accustomed to! Last month we had a visit with Amy’s parents, who came to see us in Uganda. We got to do some fun stuff with them and had some sweet time! A few days after they left, we hit the road to come back to Lohutok. We always stay overnight in Kitgum on the way home, sometimes for an extra day to finish shopping and paperwork needed to leave Uganda. The morning we were set to leave, Caleb got a fever. It seems like every time we try to get back to South Sudan, something happens! It seemed like he had malaria or some kind of viral thing, so we decided to head home. The next day he started to get a rash on his body, which is a little concerning with Caleb. In the past he has had something called HSP and we were told that he needed to see a doctor if it recurs, so thirty-six hours after we got home he boarded a plane with Amy to go to Nairobi! Amy and Caleb spent the week in Kenya while Ezekiel and I stayed home, went to some local funerals and paid visits to people we hadn’t seen in a while. It turns out Caleb had Hand, Foot and Mouth Disease which is a virus that goes away without treatment. 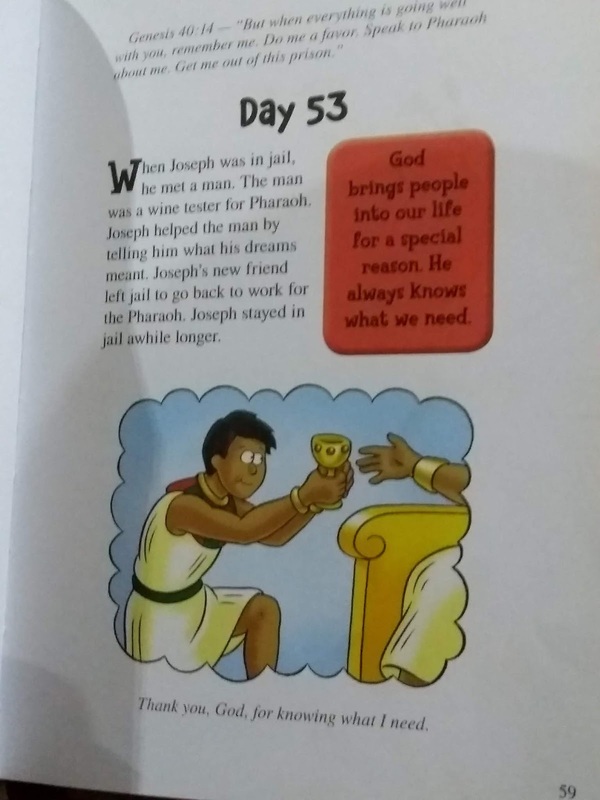 Praise the Lord! While Amy and Caleb were gone, there were some issues in our village. 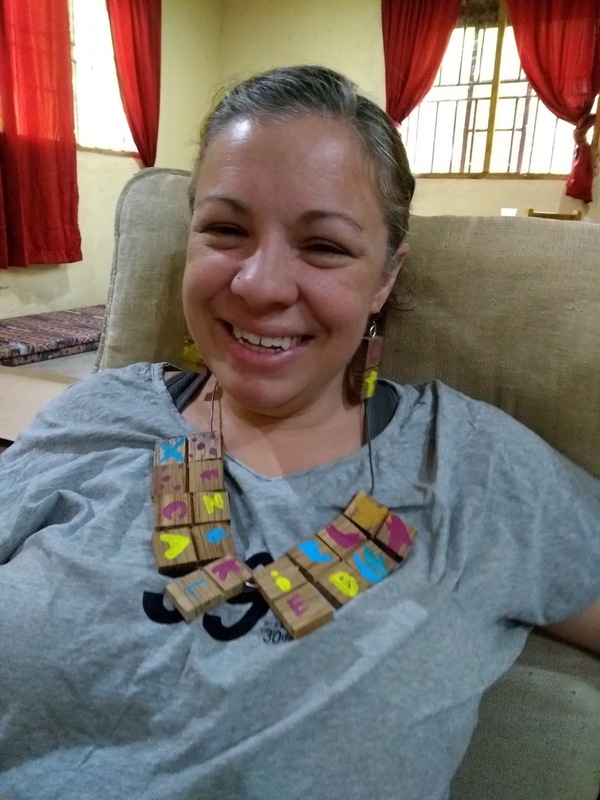 We were asked to go to Torit for a few days by our leadership, so Amy’s flight was changed and Ezekiel and I met them there the following day. We stayed in Torit for about a week while we met with various people, I had some lessons with Paul, and tried to make most of the time, and two days ago I came back. This weekend I’ve been visiting people in the village, helping with some of the needs they have, and practicing language while getting to know more people in the community. Amy and the kids are coming back by plane tomorrow! Carol: That’s okay, I don’t want to miss out on the sweetness. I was sad when these stories ended, but it meant that last week I got to start reading The Lion, The Witch and the Wardrobe, a book with which most of you are familiar. If you’re not, you should go read it and then finish this letter! We are still in the early parts of the story, but last night we read the part where Edmund, having just returned from his first trip to Narnia, decides to betray Lucy in his plan to help betray the other siblings to the Witch. Lucy had her hopes up that Edmund would corroborate her story, when he surprised her by saying it was all a child’s game of pretend. After Ezekiel went to sleep, still angry that Edmund would do such a terrible thing, I was meditating on what I know is eventually going to happen. Think about it, at the end of the book Edmund is sitting on a throne, reigning equally with his other siblings. He’s not a second-class citizen who just gets to be forgiven, he is utterly and completely forgiven and reinstated to equal kingship as the rest! This is the gospel that keeps us going when we fail, and that is absolutely worth giving up our lives to take to the unreached! We’ve had a good visit with Amy’s parents, and will be headed back home in a few days. Thank you for your support and prayer as we continue the language-learning process, and work toward new gospel relationships that will turn into churches! 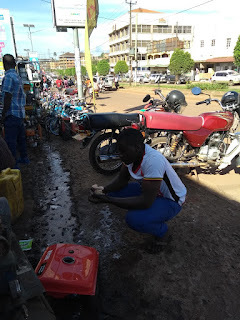 My generator needed fixed…this is what the generator repair shop looks like in Kampala! 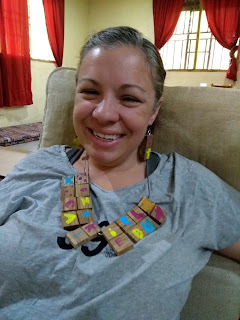 Amy got some homemade jewelry for her birthday. “Daddy, that guy is a king!” We were sitting at a funeral in the village for a small child who had died, I had taken both of the kids with me because Amy was studying language. As usual, we walked to the place where everyone was sitting, shook hands with the whole group of women, and then with the whole group of men, and sat down with the men. Ezekiel and Caleb were shy and I had to keep reminding them that it’s rude to not greet people, and eventually they finished shaking all of the hands and started playing. The men usually call out to the kids and try to talk to or play with them, and our kids are always shy and give the “leave me alone” whine, and they were doing it on this day. It is customary for people to get up and share something with the people who had come to mourn, sometimes just talking about the deceased, sometimes encouraging people not to despair (suicide is a common issue on the village) and sometimes just….talking. I was rehearsing in my mind the Bible story I wanted to tell and looking up a few vocabulary words on my flashcard app so that I could try to tell it in Lopit when my kids started saying “Daddy! Look, a king!” I turned around and saw a man coming who was wearing a traditional African-style hat. He is a Major General in South Sudan’s army, and is an important person in the village, but has been away for many years stationed in a far part of the country. The General came and sat with us under the tree and I introduced myself and we began to talk. My kids, who are usually closed off and shy with Lopit people trying to greet them (EVERYONE tries to grab the kids and they, understandably, don’t like that!) started climbing on the General, playing with him, bringing him into their pretend games, and even inviting him to our house that night for supper! As it was time for us to go home, I told the General that I wanted to address the crowd before I left, and proceeded to tell the story about the death of David’s child, how David was confident that one day he would see his son again, and how he could be sure of that future because he was a man who chased God’s heart. I talked about how the heart of God is for people to repent of sin, turn from their old life and follow Jesus, and how that gives us confidence about our place in eternity. I also said that people who reject the Savior will be separated from God and everyone else, but the reason we are in Lohutok is because it is our desire to see people united with God and following Him. It is customary, also, as someone is speaking at these events, for another person to stand and repeat everything that person says. I still don’t understand the reasoning behind this, but that is what is usually done. On this day, the General stood to be my <repeater>. Later that night the General did, in fact, come to our house for supper and we had a good talk about who we are, why we’re here, the need for the gospel in Lohutok, and our approach to learning language and discipling people before any other “development” is possible. He heartily agreed with us and left our house as a new friend and advocate in the village. We were also able to discuss with him the right approach to some village politics that have been plaguing us as men who claim to be “the church” come and seek power and money. I remember when I was a new believer, the person who led me to Christ graciously included me in his family for years following my salvation. I remember seeing the pressures put upon children in ministry, and how he labored hard to give his young son the freedom to just “be a boy” despite being constantly watched and criticized. We have tried hard not to put these pressures on our kids, but the fact is they are part of our ministry here and their behavior affects the way people see the gospel. Sometimes missionary children just stay separate from the community, and sometimes they are so much a part of the community that they aren’t kept safe in a place where they are outsiders and treated differently, but we have tried hard to seek the balance between these two. On this night, as we were doing family devotions, we talked about 1 John 4:7-8, one of the verses that the kids have memorized, as well as what Jesus said about loving our neighbors as ourselves. I encouraged Ezekiel that, although he’s normally shy and scared around local people, tonight we made a good friend in the village because Ezekiel thought to invite him, and even insist repeatedly, that the General come over for supper. It was a good lesson for the kids about being in Lohutok to show and tell people about Jesus, and the way that our actions and attitudes toward them communicate way more than our words. Both of us had birthdays since the last newsletter. I think my presents were better than Amy’s but she disagrees! Please continue to pray for us as we work here. It is hard to say “We’re just going to study language until we’re fluent enough to start doing evangelism” because the long missionary history in this village leads to lots of outside pressure from the community leaders and “The Church” here to spend lots of money doing development projects and other things that are not sustainable and don’t last when missionaries leave. As I write this, I’m still cooling down after yesterday’s 2 ½ hour meeting with some people who came to the village just to “shake down” the missionaries, make us feel threatened, and try to shame/force us into doing projects for which we’re not equipped or called. Pray that God would sustain us, give us grace and patience, and continue to provide us with key relationships in the village that will help protect us while we are in the learning phase of this long-term ministry. On another note, we are planning a home-assignment for later this year. We will be in Kansas City around the end of August and will return to Lohutok after the holidays. I’m busy working on the calendar for those months, lining up where we will be speaking so we can decide when we’ll be in St. Louis, Columbus, Corinth and the other places we need to visit. If you are interested in having us come and give an update to the church, please respond to this email or contact me another way and we would be glad to set something up! As always, thanks for your prayer and support! 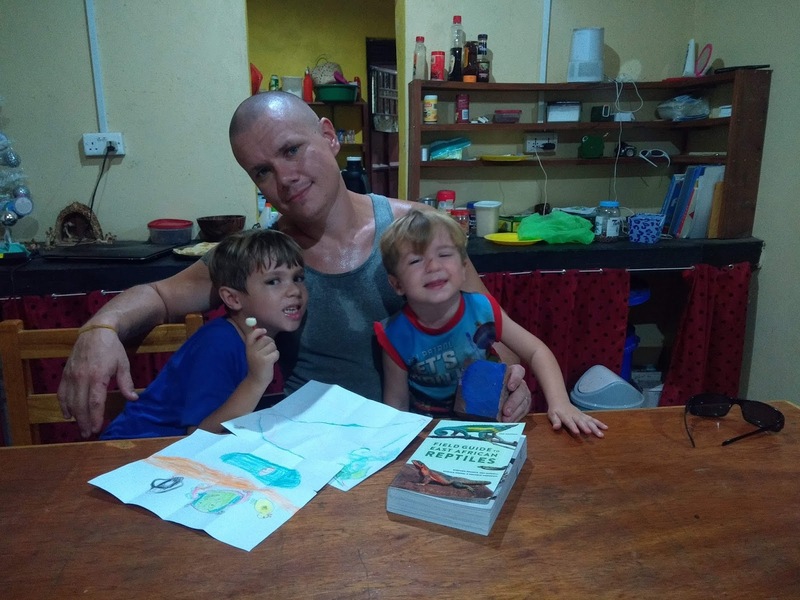 Our kids love having books read to them…if anyone seems interested in reading to our boys, it may never end. On this day Aunty Carol was the willing subject! 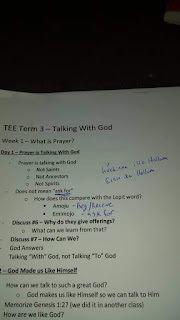 This “term” I am going through 10 weeks of lessons with Paul on prayer (“Talking With God” is the title of the book) and the non-church letters of the New Testament. 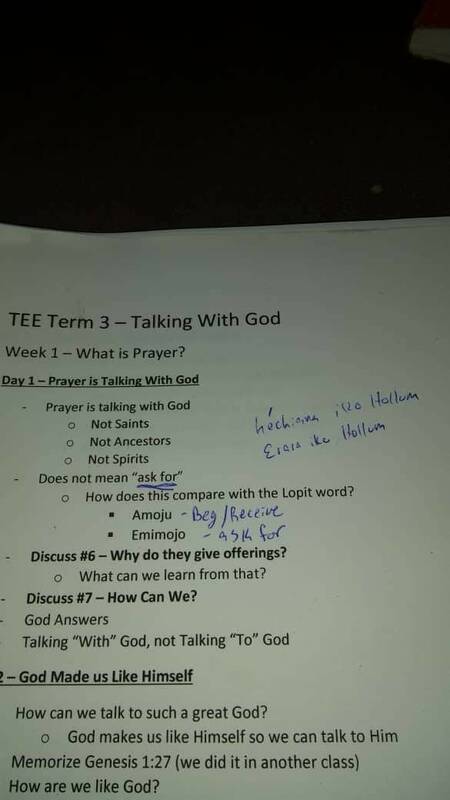 The picture you see is a snapshot of my notes from our first meeting for the course on prayer. When I asked that question, Paul immediately lit up and said “Yes! I was going to ask you the same thing!” The next day, Sunday, Paul told the story of creation all the way up to Adam and Eve hiding from God in the garden. He asked the people what Adam and God were doing at the beginning when God was bringing him the animals to name and walking with them in the garden, and then He asked them what it was that caused Adam and Eve to be afraid of God and hide from Him rather than enjoying their fellowship (the answer is sin). Paul then asked the church what they call it when they need to travel for an emergency and have to call an uncle or relative and beg for money to help, and they gave him the word “Amoju” which sounds like the word for prayer “emojo.” He gave a few more examples, and then he asked “What should we call it when we’re telling God our problems, praising him, repenting, etc.” and everyone was quiet. As a group they eventually decided that instead of using the normally-accepted words for prayer, they were going to start saying things like “Erara iyohoi iko Hollum” (Let us talk with God). It’s a small change, but huge in a culture where dependency is so widespread and new believers are learning what a relationship with God looks like. Will you pray with us for the church here as they grow in their understanding of basic Christian truths? The small group of ladies who meet with Paul still struggle with traditional religion and syncretism, pray that as Paul grows in his study of scripture and theology that the church would grow in their passion for the gospel! We are all doing fine as I’m writing this. We’ve had a bit of a break from everyone being sick, helping team members evacuate because of sickness, fixing internet and car issues that never end, and now that the holidays are almost over it’s time to buckle down on language learning again. Pray for joy and perseverance as we struggle to learn the language well to effectively communicate the gospel with people, and pray that God would guard us from more spiritual warfare as things seem to constantly come up. Thanks as always for your prayer and support! We celebrated Teresa’s birthday this month. She was pretty happy to get an onion chopper like the one Amy uses at our house. A year ago we were on our way back to South Sudan after a period of time when I was here building our house and Amy and the kids were in Uganda. We stopped for lunch on the way up and saw another American family with children, so we started visiting with them. We happened to see the same family at the same restaurant twice after that, it just turns out that all of our trips happened to coincide. A few weeks ago, our family was headed home after training in Kenya and we stopped to visit our new friends for lunch on the way. While our family was headed home we started having car trouble, again. While we were in Kenya our mechanic was working on the transmission and injector pump, but it turns out that the problems weren’t completely solved, and we were halfway back to Lohutok before we found out – the hard way. We stopped in Kitgum, where we normally overnight on the way home, but instead of just spending the night we spent five. The mechanic came from Kampala with a transmission in the back of his car, installed it in our LandCruiser, it still didn’t work, he went back for some kind of computerized control unit that was required and he didn’t realize was missing from the car when he came, brought that back to Kitgum and installed it, and the transmission still didn’t work. While at the hotel Caleb got a bacterial infection that kept him up at night, and Ezekiel went on antibiotics for an ear infection. At this point I (Justin) was just ready to give up. How much time are we going to spend on car trouble and sickness? When the mechanic told me he had to go BACK to Kampala again to get a new control unit, I told him to just go in our vehicle. 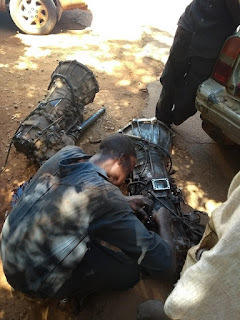 It was drivable but not shifting right, so if he could get it back to Kampala he could finish the work there instead of doing more back-and-forth for spare parts. He agreed, left me with his vehicle (a funny little Suzuki that looks like a roller skate) and left with our LandCruiser. The next problem I had to deal with was where we would stay. We were already way over budget on car repairs, and the hotel stay that was supposed to be 1 night had turned into 5 already, and who knows how long it’s going to take to actually fix our vehicle? 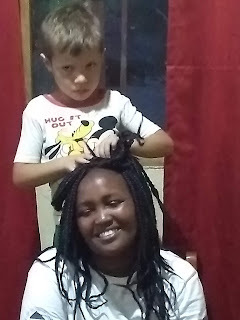 We have a place in Kampala, but that means having the kids in the car for an extra 2 long days of driving, and our place was being used. We messaged a few other friends just to see if there was anything available that was cheaper than where we were staying, but doors just closed left and right. 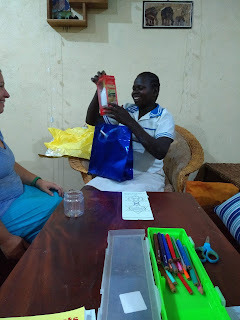 Finally, Amy decided to message our friends whom we had only met on a few short occasions (and who lived just an hour away from Kitgum) to see if they had any ideas. It turns out, they have a guesthouse and, although they normally charge per night for people to stay there, they wouldn’t ask anything from people like us having an emergency. We ended up staying in the guesthouse for the next seven nights. Amy got to meet some new missionary wives/mothers while Ezekiel and Caleb got to make some awesome new friends, and Justin got to go back to Kampala to get the car…and then spend the night again on the way back because the alternator/battery weren’t charging! Last night was our first night home getting back into the routine of family time/devotions. 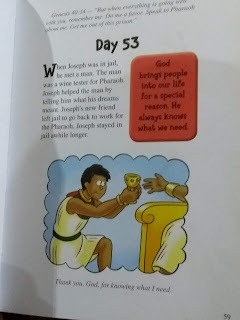 When I opened the book and realized what story we were on, we talked to the kids about how God used all of Joseph’s problems to bring about something really awesome, and God put people in Joseph’s path who could help him later when he needed it, just like our friends in Uganda were there when we needed them. Praise the Lord for his kind provision! Now that we’re back it’s time to get going on language learning again. 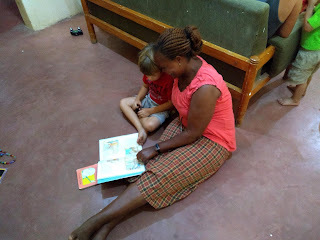 Pray for us that we make good progress in language and homeschool over the next stint in Lohutok, and that God would protect us from more car trouble and sickness!